So we’ve had a lot of rain in Bristol this summer. But it’s England, so yeah. However, a farmer told me when you pair that with mild temperatures, it can make for a good apple crop. 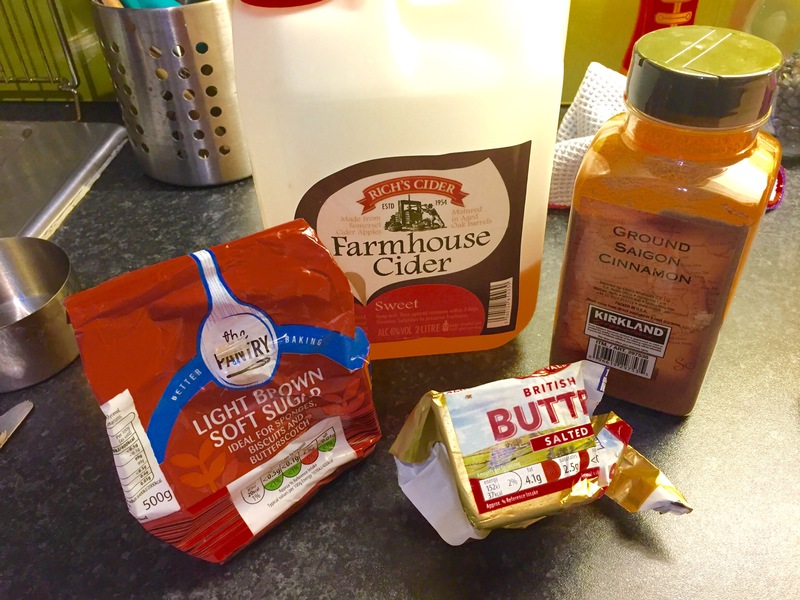 Good apples make for good cider, and good cider is great! 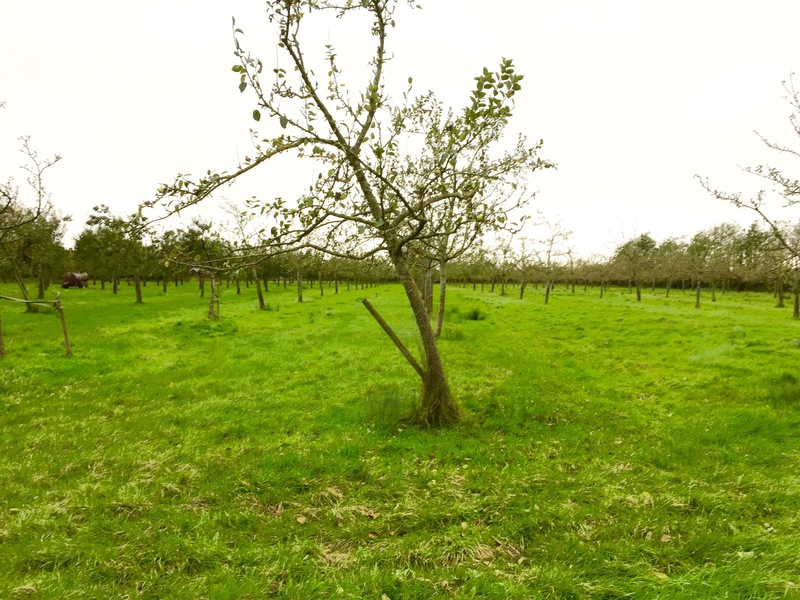 So I decided to take a trip to Rich’s Cider Farm located in Highbridge, Somerset, just down the way from Bristol. 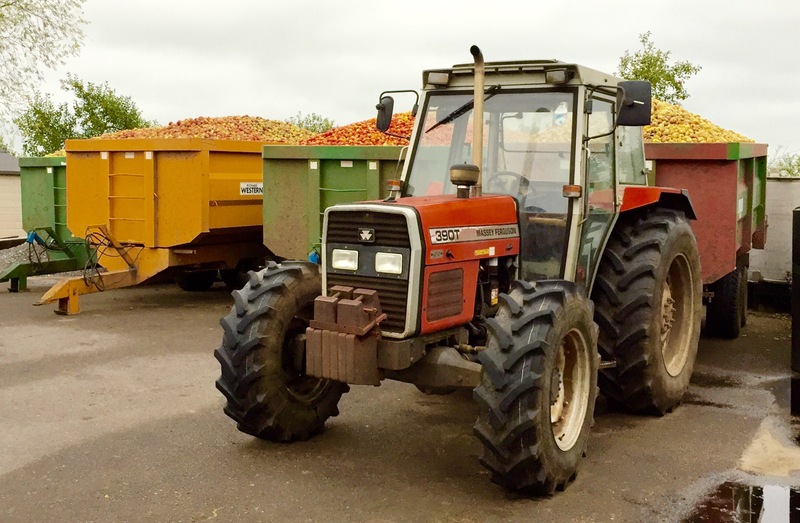 There were tons of apples waiting to be made into cider. And you can smell the sweet scent of cider as soon as you step out of the car. There is a restaurant on site which does a nice carvery, if you book ahead in advance. 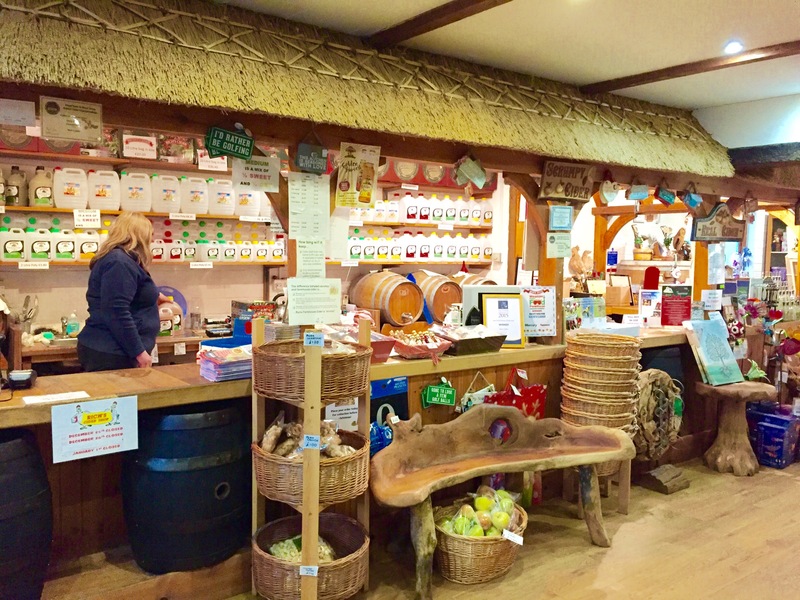 There is also a shop chock full of freshly cracked barrels of cider, ready to taste. They also have a great selection of cider brandy, cider vinegar, wine, beer, and lots of other treats. 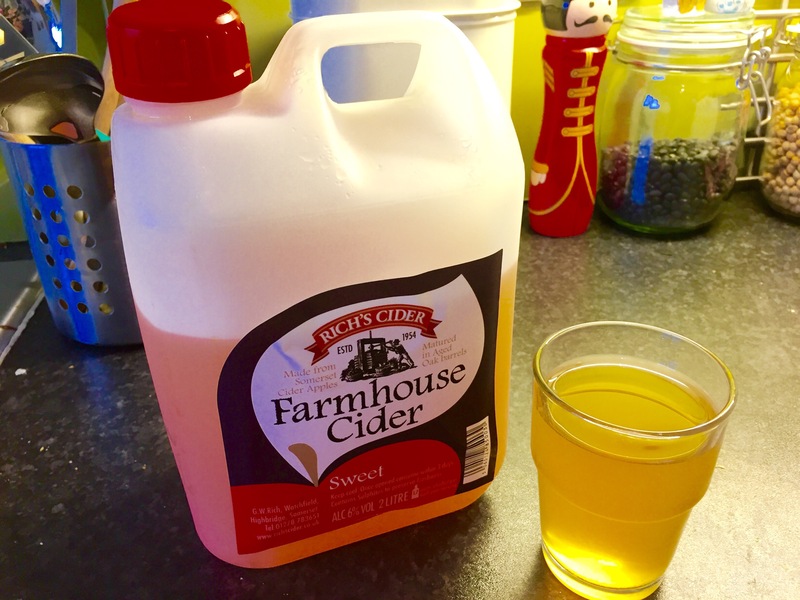 We picked up a 2 liter jug of sweet cider to drink, bake with, drink, and drink. First, wash, core, peel, and chop the apples. These were given to me from a friend. 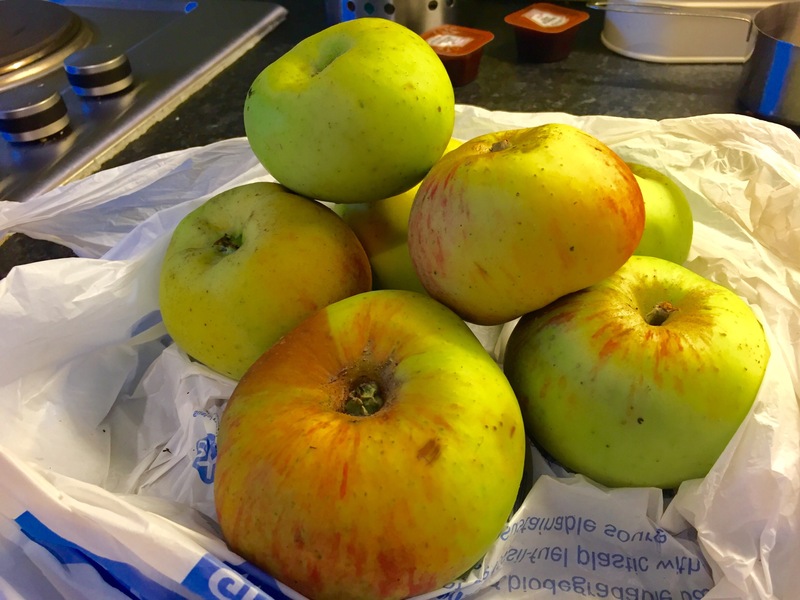 I’m not sure what kind of apples they are, but they’ve been great to bake with so far. 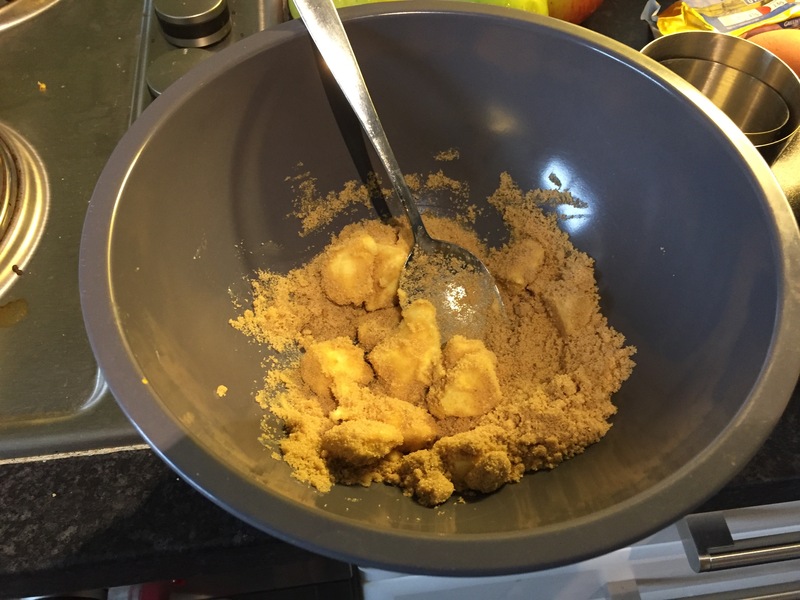 Next, cream the 3 tablespoons of butter and the 2/3 cup of brown sugar. Add the chopped apples and mix thoroughly. 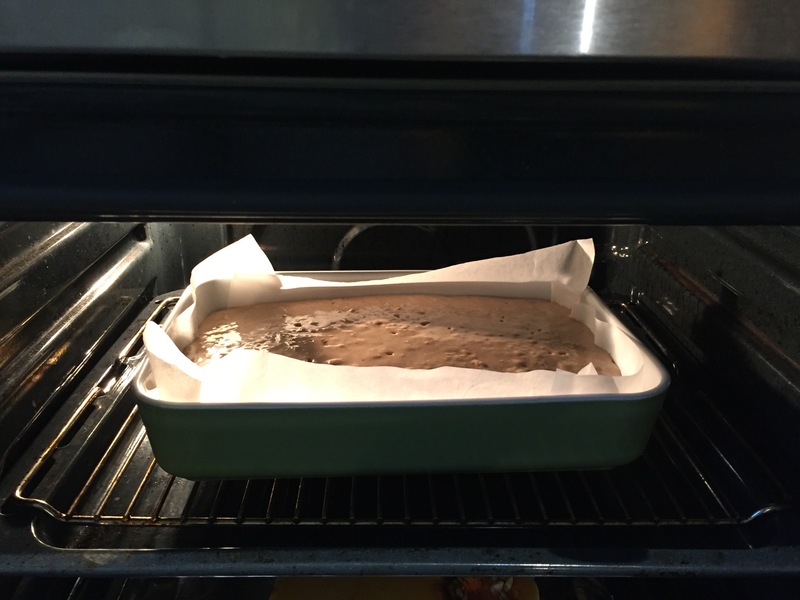 Grease or line a rectangle baking pan with baking paper. 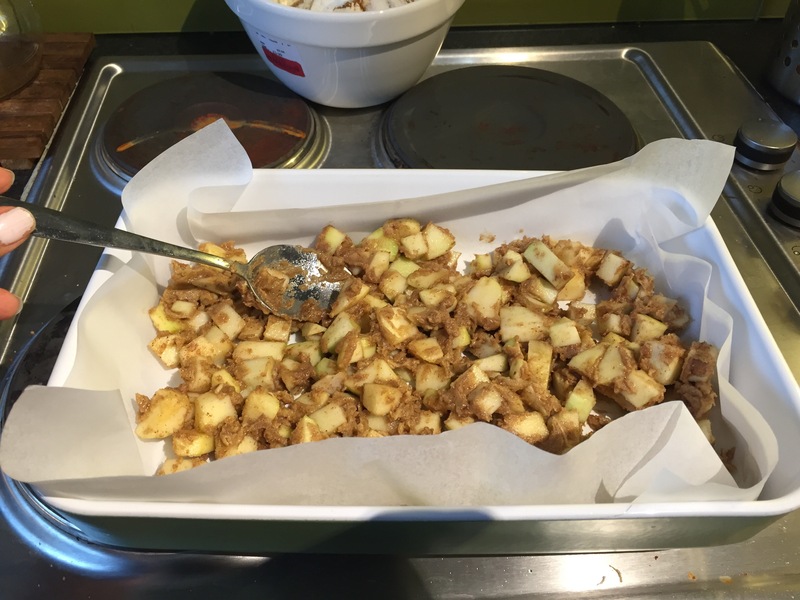 Spread the apple mixture on the bottom evenly. 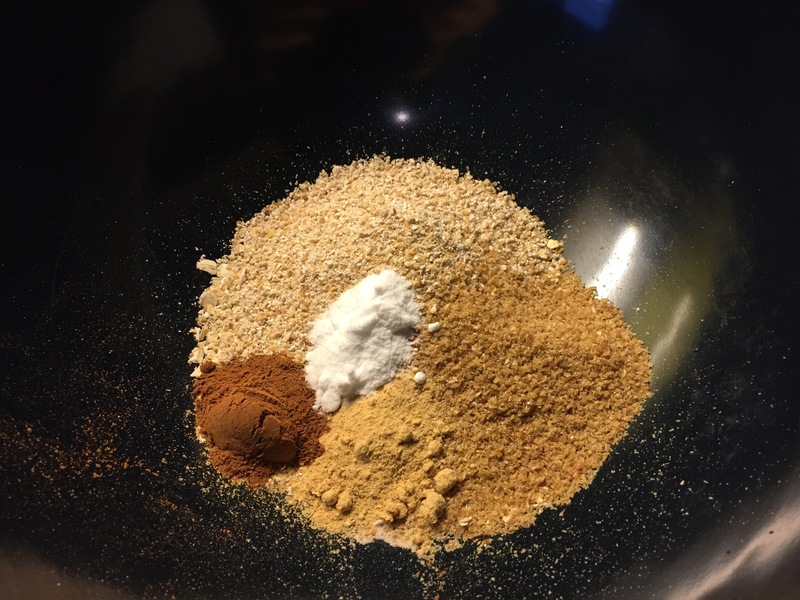 Next, combine the flour, cinnamon, nutmeg, salt, and baking soda in a bowl. Set aside for now. You will then mix the butter, both sugars, vanilla, buttermilk, and egg together. If you don’t have buttermilk, simply add the juice of half a lemon to a cup of whole milk (that’s what I did anyway). Slowly add the dry mixture to the wet mixture. 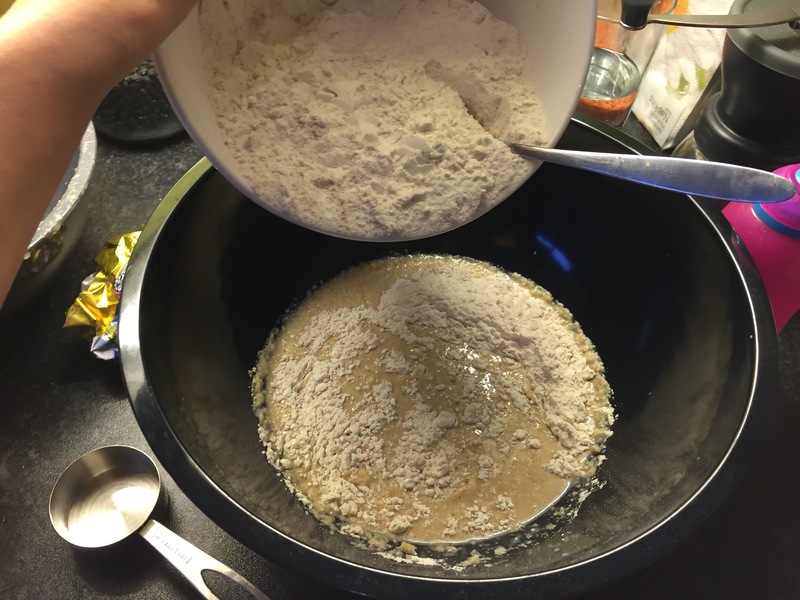 As you stir, it will become a thick batter. 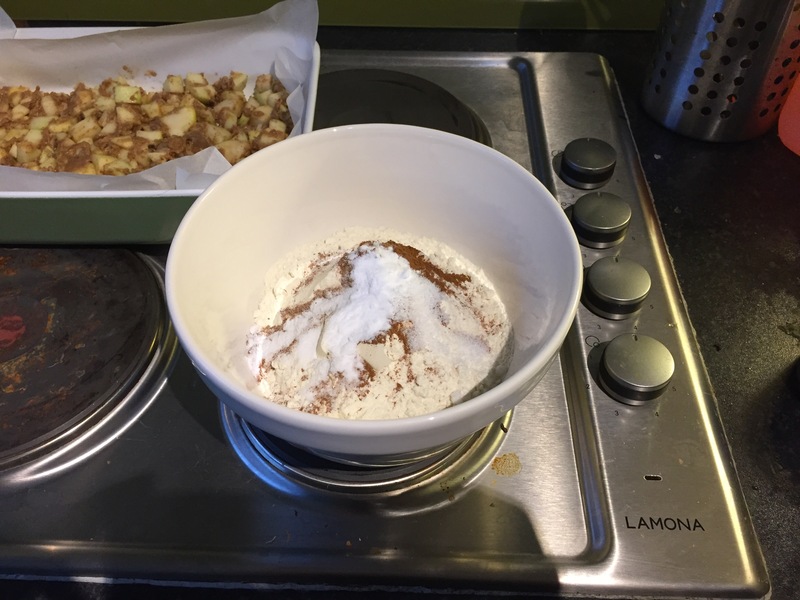 You will then add one cup of apple cider and mix carefully. Make sure you don’t leave any big clumps, but at the same time, try not to over stir. 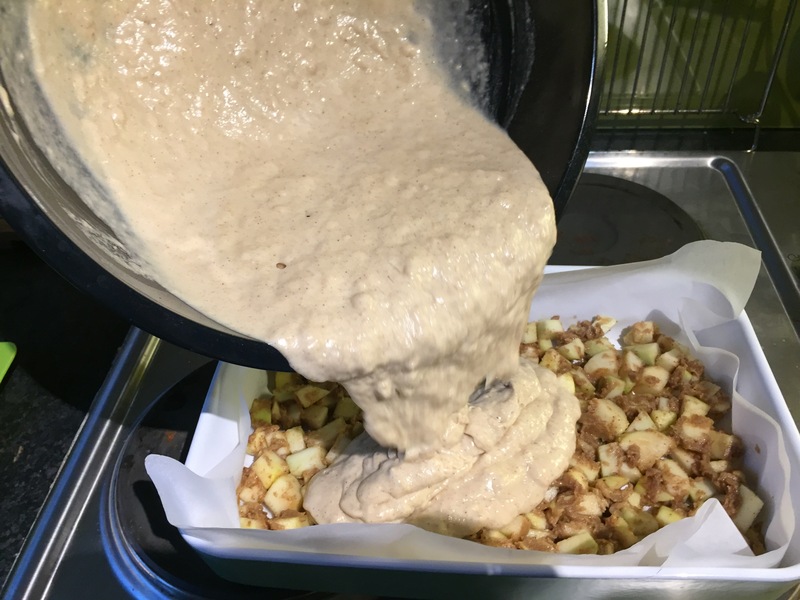 Once combined, pour the batter over the apples. Spread it out so it completely encases the fruit to the edge. Bake the cake for 50-60 minutes at 350 C / 180 C. Once ready, check the center using a toothpick or knife. If it isn’t firm, bake for 5 more minutes at a time until set. 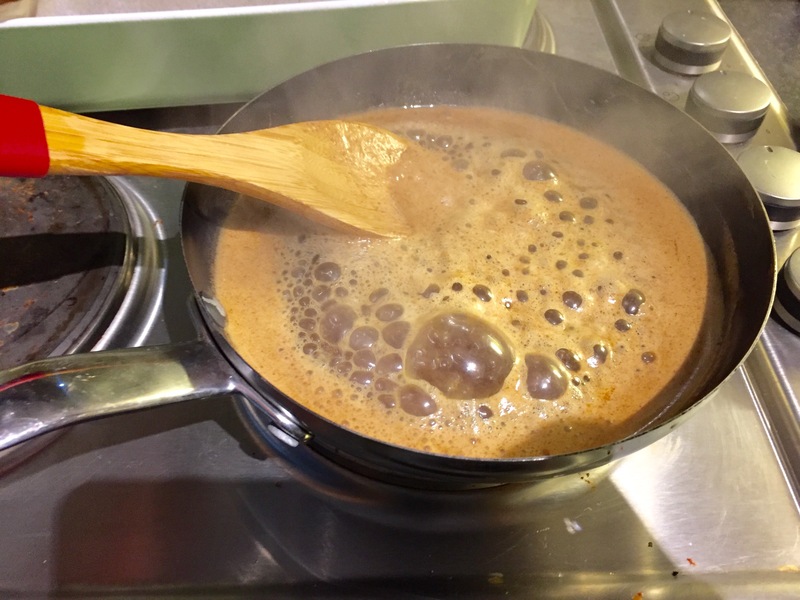 Combine all four ingredients into a sauce pan and bring to a light boil. I made mine while the cake was cooling, but next time I’ll start it when the cake is completely cool. 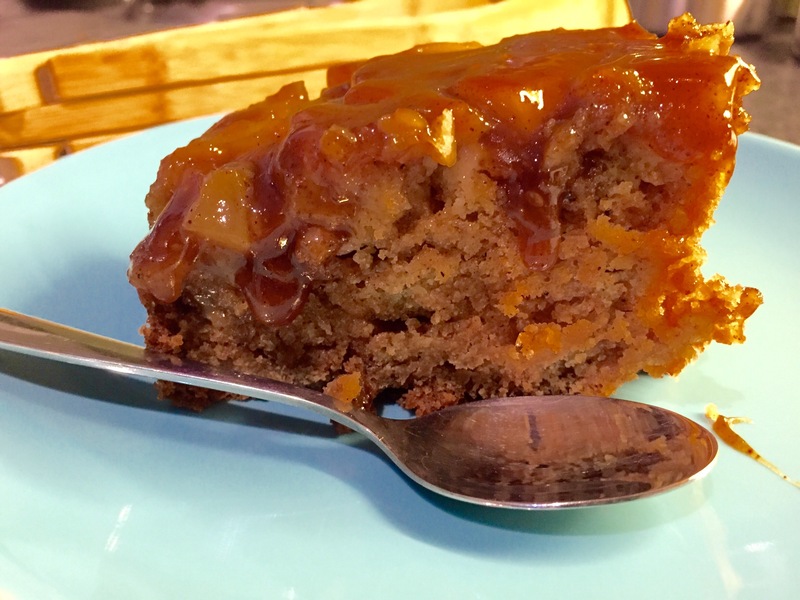 Keep an eye on the caramel glaze, constantly stirring. You’ll want to reduce it quite a bit, to about 1/3 or so. I have a ceramic hob, and kept it on mark 4 which was hot enough without burning it. Once it reaches a thick consistency to the point where it coats the back of a spoon, take it off the heat and let cool for at least 10-15 minutes. 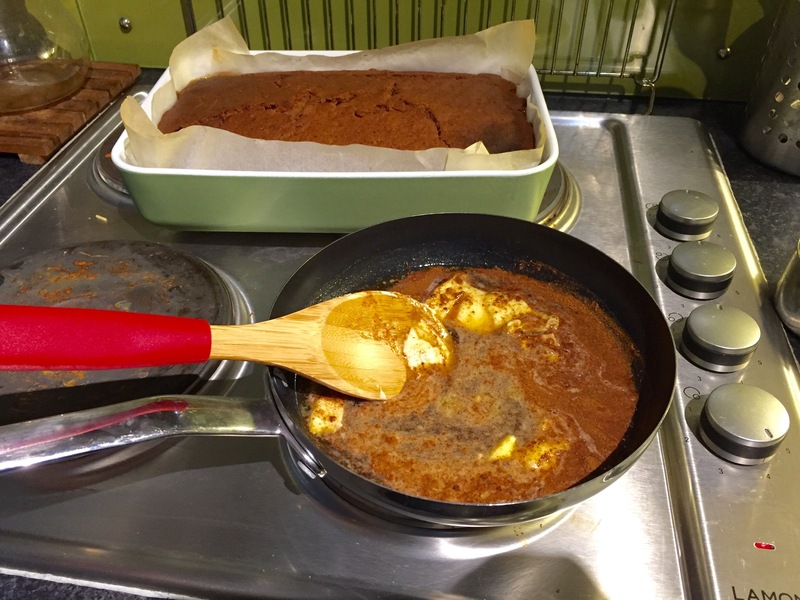 It will thicken as it chills a bit, but make sure it still retains a bit of warmth to easily spread over the cake. And there you have it!! 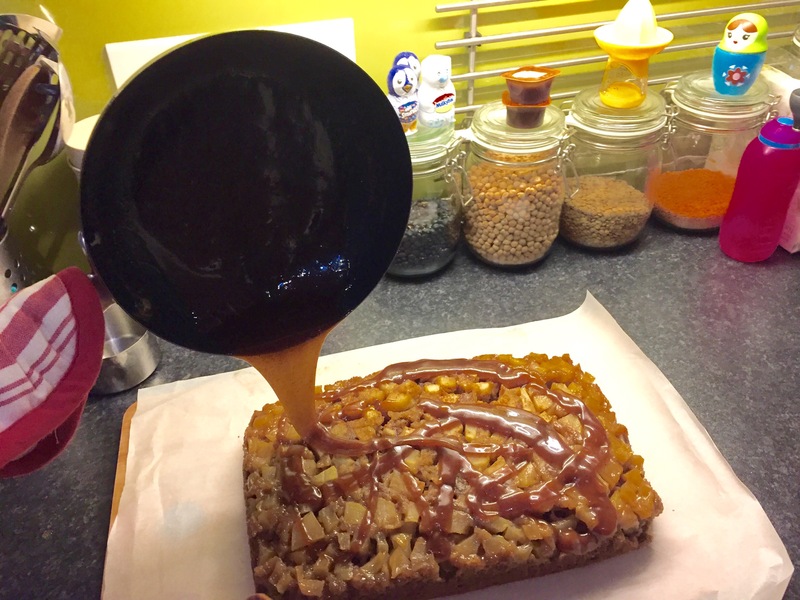 Apple Cider Cake with an Apple Cider Caramel glaze!!! I used so many exclamation points because it turned out damn good! It may not be pretty and the presentation kind of resembles the way I felt walking outside today in the wind and rain. 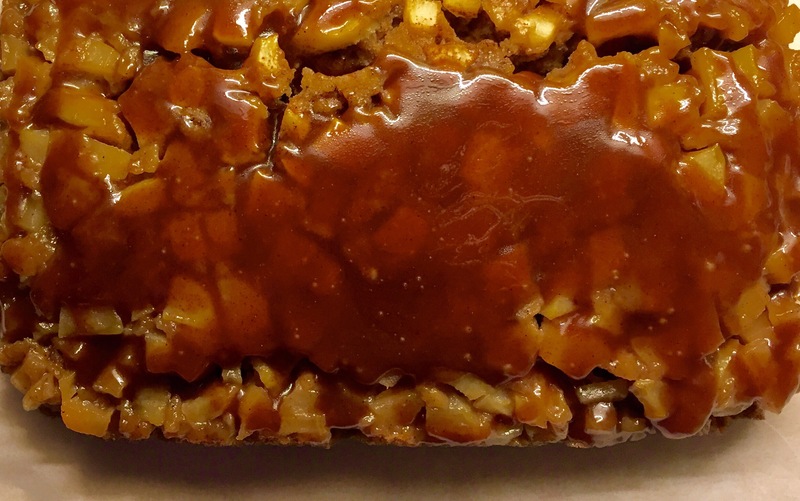 But hot damn if that bit of joy doesn’t just melt in your mouth! 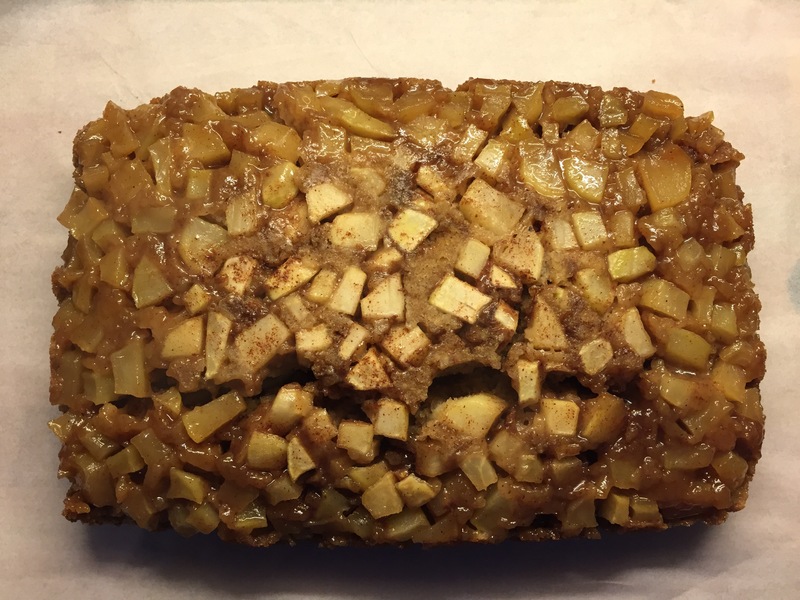 It’s sweet, gooey, and the apples make it nutritious! Well, good for your soul anyway. Where ever you are, I highly reccomend finding some local cider and freshly picked apples to create this beauty. I will definitely be staying in tonight to tackle this treat. Take care out there Bristol, thanks for reading, and happy eating! Feel that wind? 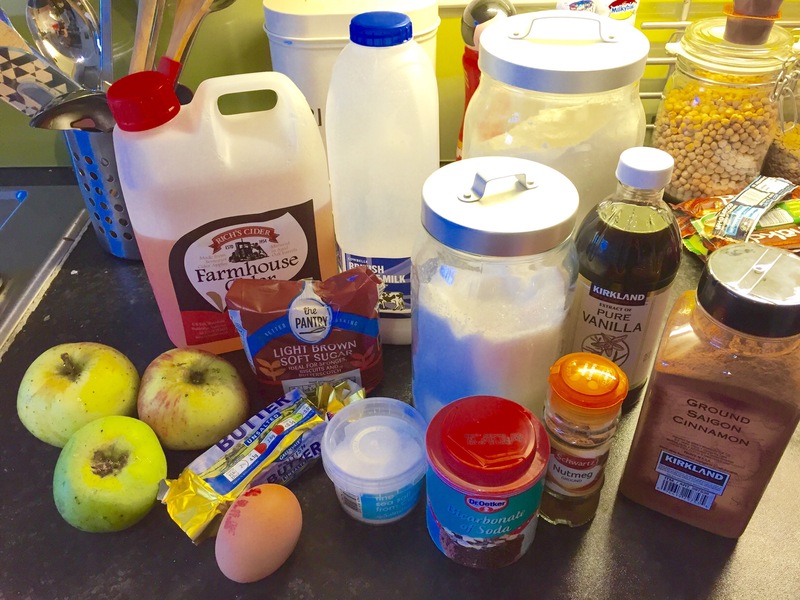 Winter is nigh… so let’s make apple scones! 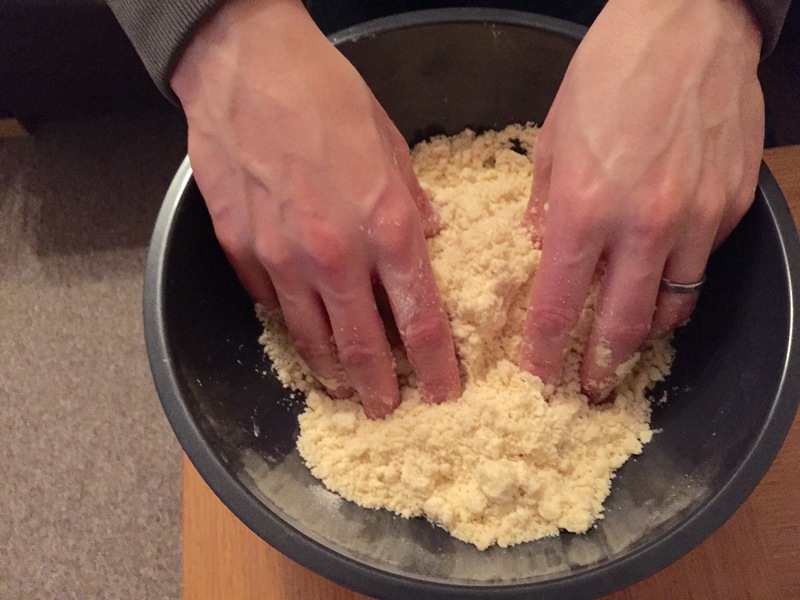 First, in a large bowl, rub the butter and flour together until it resembles a crumbly texture. Next, add the sugar, salt, and baking powder. Combine thoroughly. 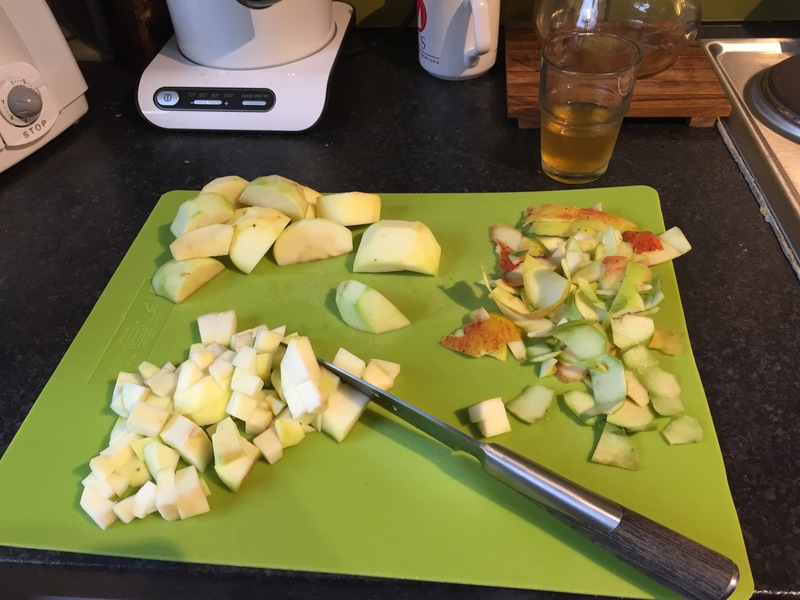 If you haven’t already done so, chop the apples. 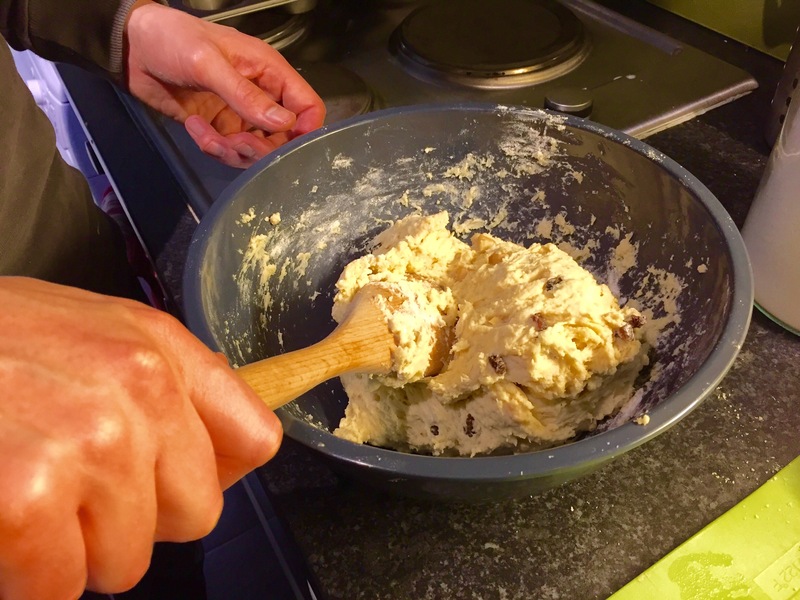 Add these and the raisins to the flour mixture. 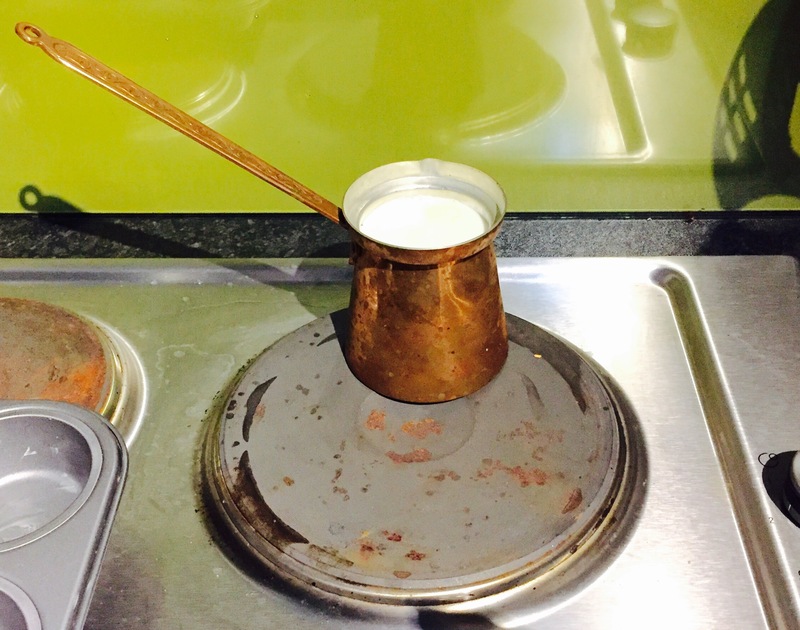 Next, you’ll want to warm, not boil, the milk. Add the lemon juice and vanilla to the warm milk, turning it into buttermilk. 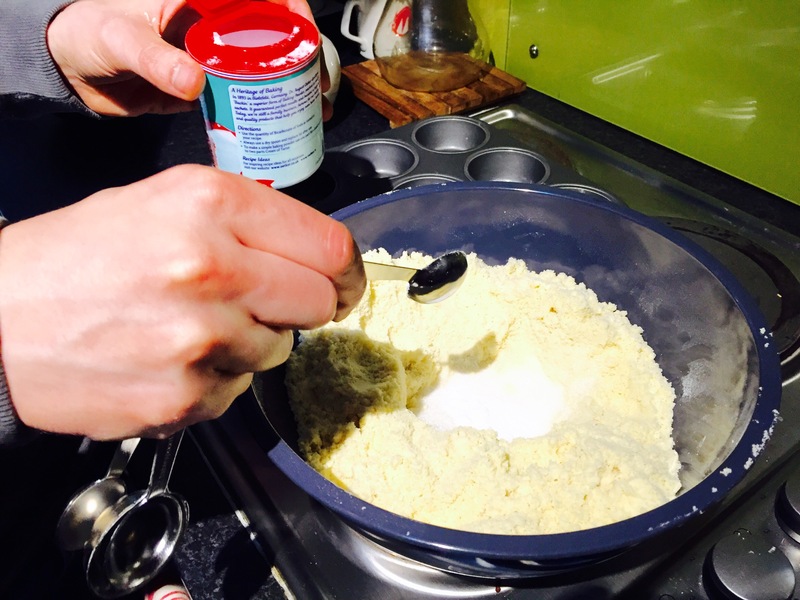 Once you achieve a buttermilk texture, add half to the flour mixture and combine. Gradually add the rest of the buttermilk until you have a doughy blob of goodness. 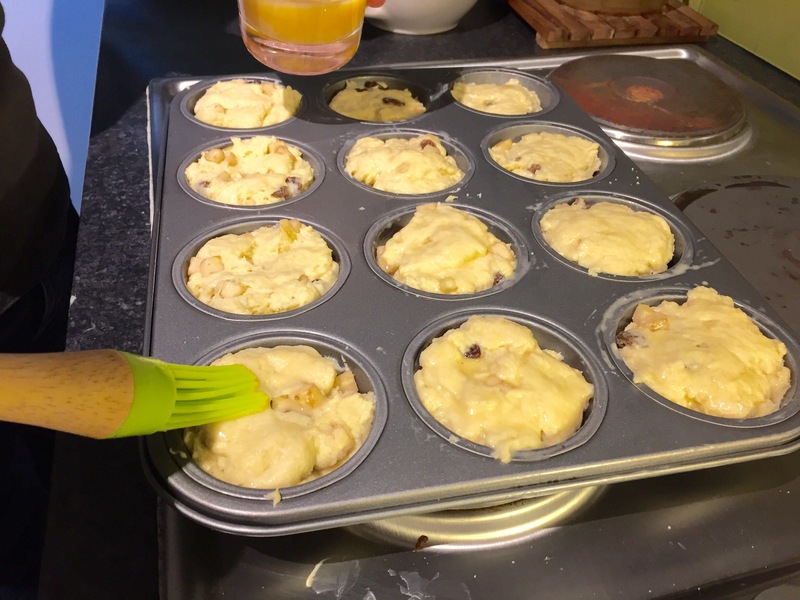 At this time, heat your oven to 190 C / 370 F. We decided to use a greased muffin tin so we would have evenly shaped scones, but you can just as easily form them by hand. 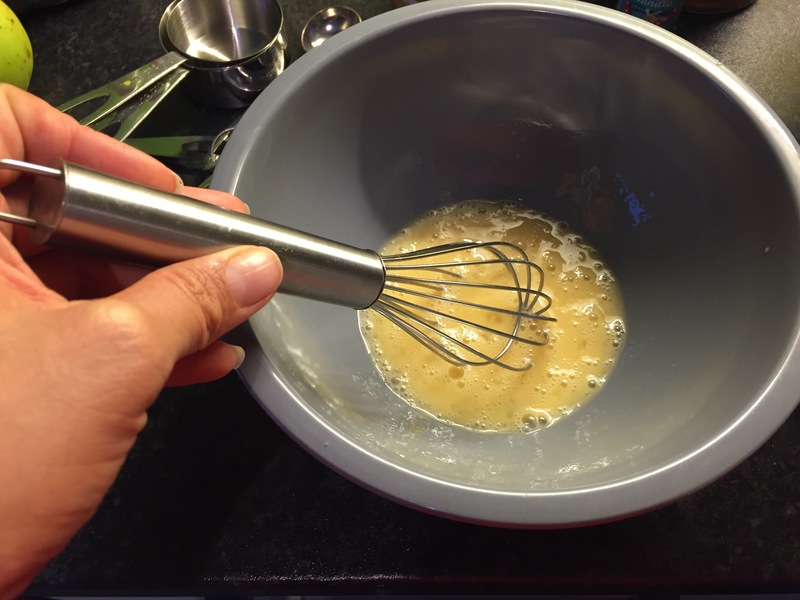 Next, whisk an egg and brush it on top of each scone for a lovely golden color when done. Bake for 14 minutes and proceed to eat! And there you go! Freshly baked apple scones using hand a picked apple given to us from a friend’s tree. This is a perfect treat to enjoy hot from the oven on a cold, blustery day. 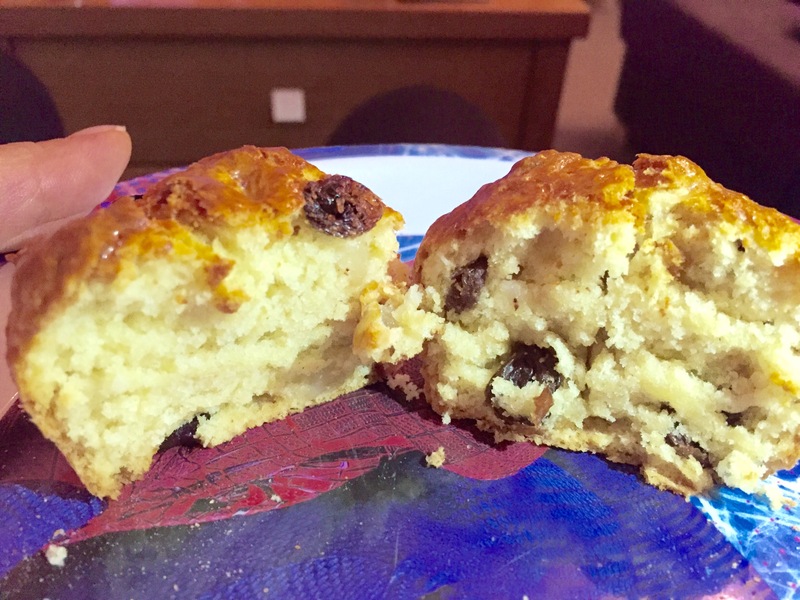 The recipe makes about 6 scones. 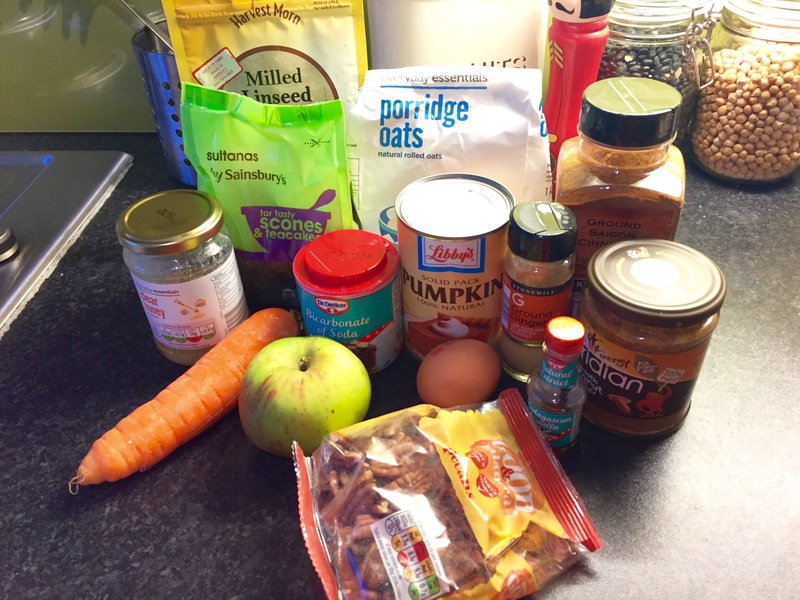 We ended up doubling the listed recipe because I think carbs are great! 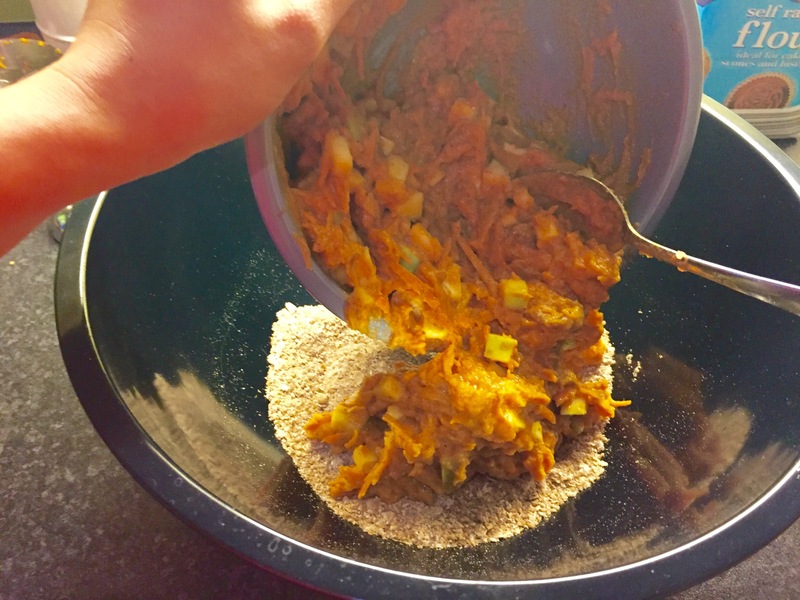 This is also an easy recipe to change if you want to add something other than apple and raisins. Maybe chocolate chips and walnuts, or pecans and toffee nibs perhaps? Or cranberries and almonds – this would be a nice combo for Thanksgiving morning. 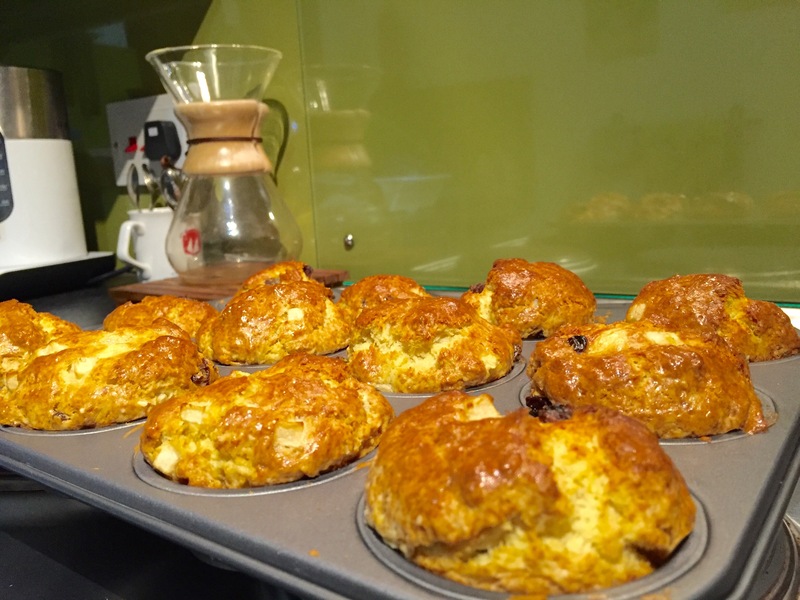 Any way you bake it, I hope you enjoy trying your hand at some scones as the weather begins to get chilly. Stay tuned for more treats Bristol! I’ve got a special cake coming up soon. In the meantime, thanks for reading and Happy Eating! Rain, rain, and then some more rain. The leaves are sparse on the trees and the warmth is slowly fading away. So, pretty much a typical English autumn day. 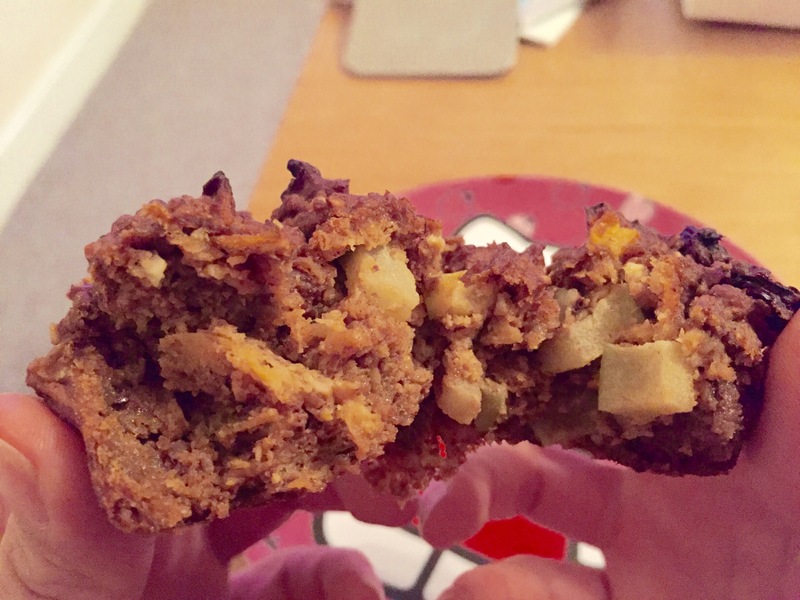 So I thought it called for some Harvest Muffins that utilise apples, pumpkin, and carrots. 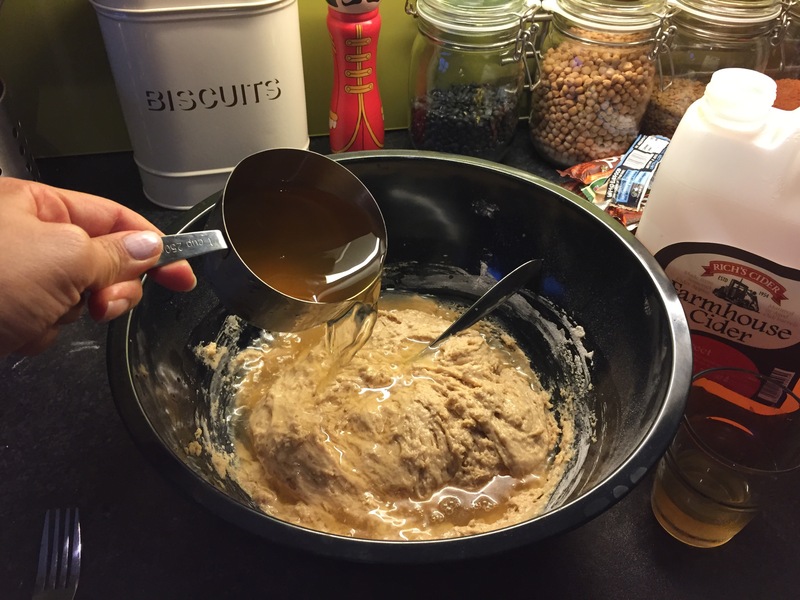 First, in a large bowl, add the oats, linseed, ginger, cinnamon, and baking soda. Mix and set aside. 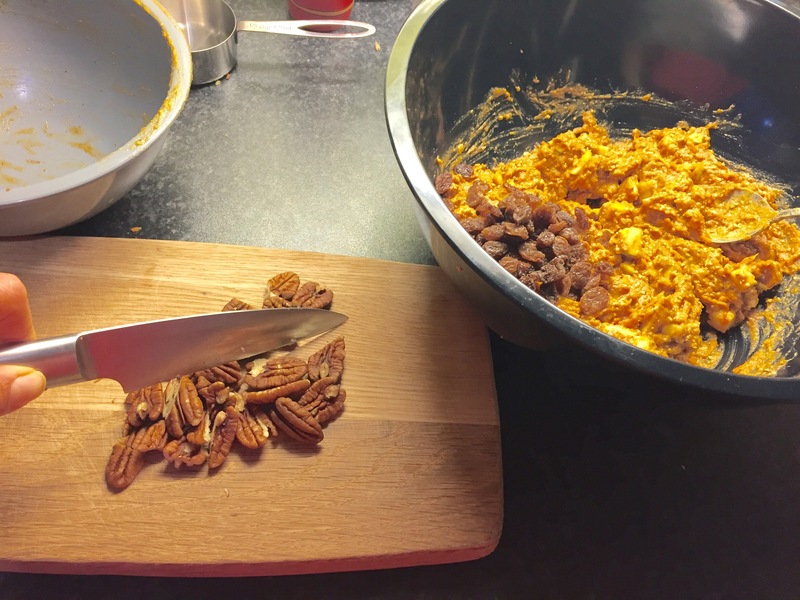 Then add the honey, nut butter, and pumpkin to the beaten egg, and stir it all up. 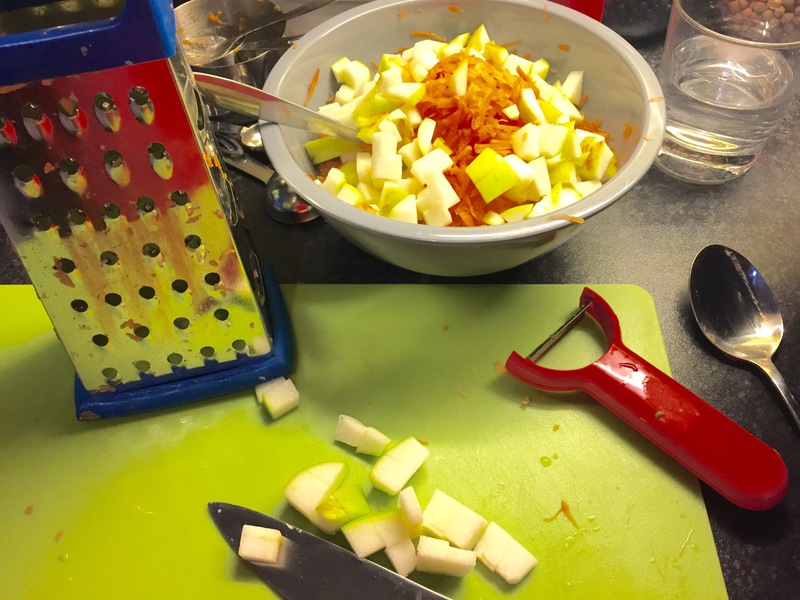 To the moist mixture, you will add the chopped apple and grated carrot. Mix thoroughly. 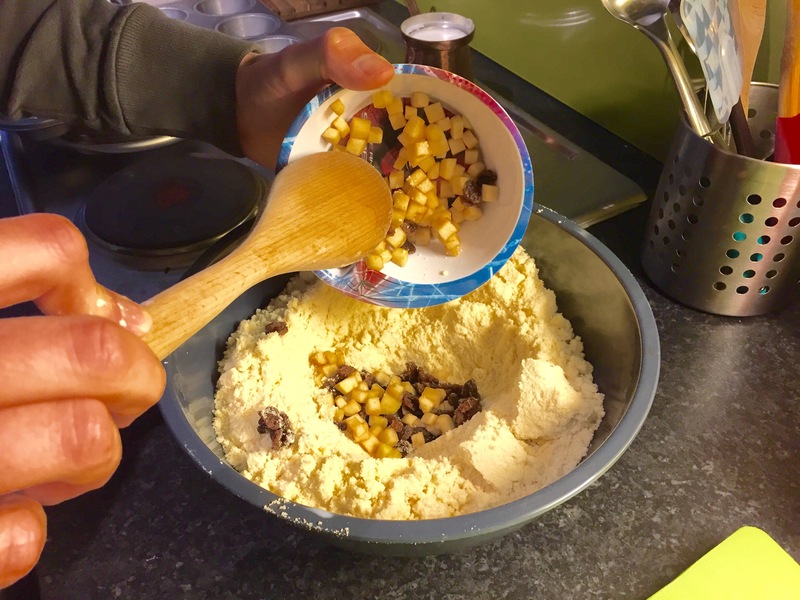 Add the moist mixture to the dry ingredients, mixing well. 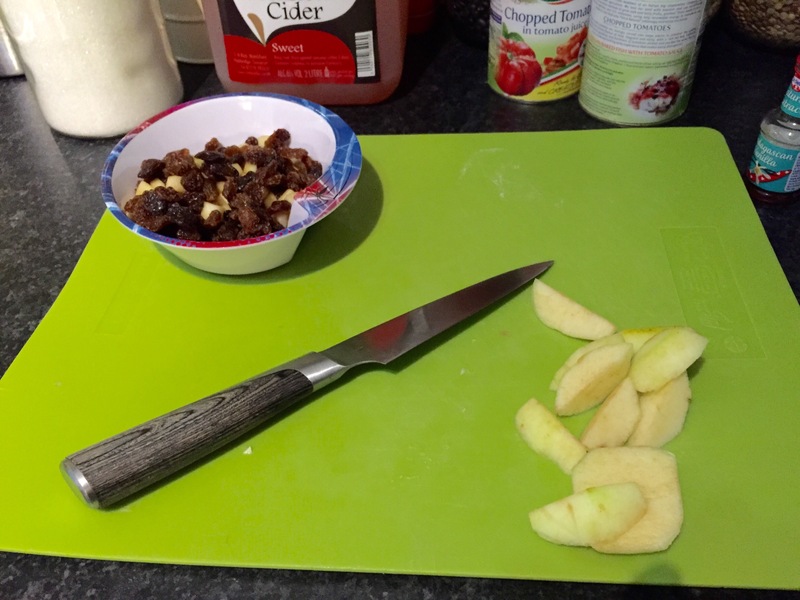 Lastly, add the raisins and nuts, chopping them if need be. 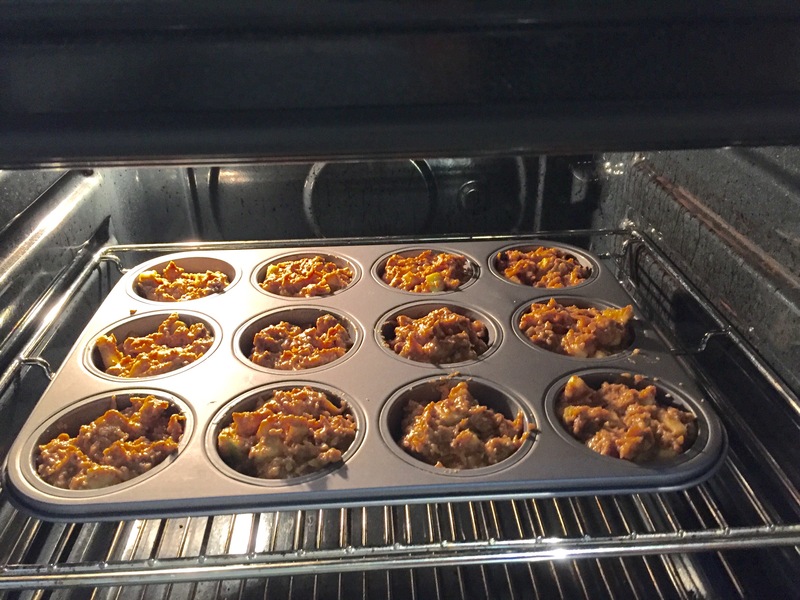 Preheat your oven to 375 F / 190 C and grease a 12 cup muffin tin. 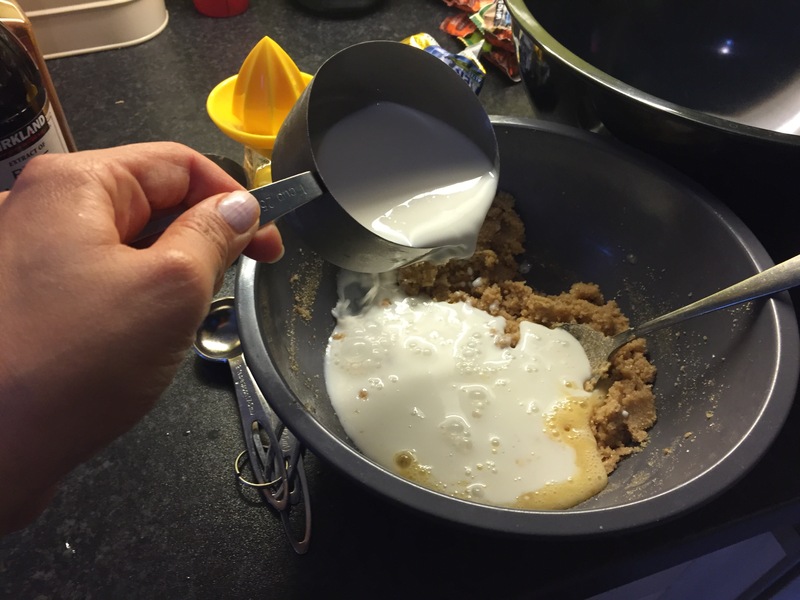 Add a heaping spoon full of batter to each cup. Bake for 20 minutes on the middle or bottom rack. Note that they may not rise much, but they will be baked. 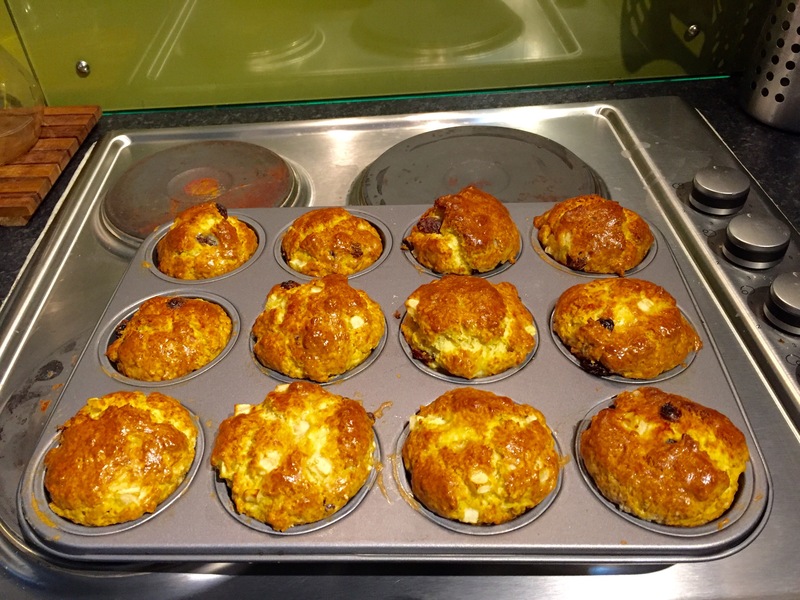 And that’s it, Harvest Muffins perfect for a rainy day! 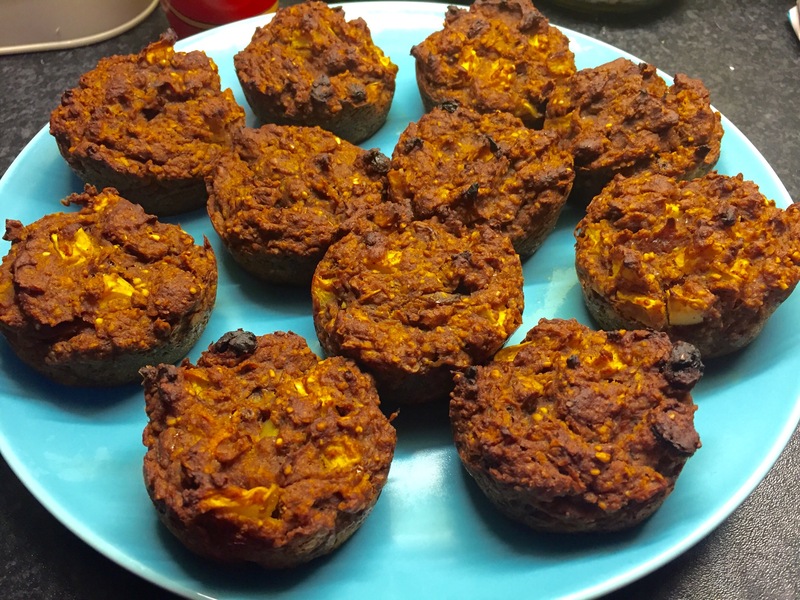 They are chock full of good ingredients and can be made gluten free by using certified gluten free oats or even coconut flour. These are the perfect type of treat to make if you have a surplus of apples and carrots from your autumn harvest. 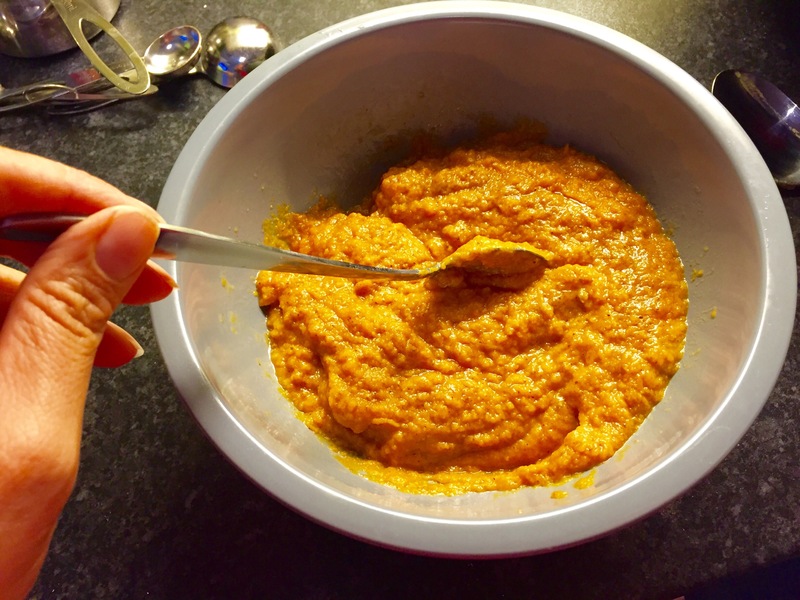 And if you don’t have any pumpkin, you can use one cup of apple sauce or even mashed banana. Enjoy on their own or with a hot cup of apple cider. Stay warm out there, thanks for reading, and Happy Eating!